Aerofit Spin bikes are built to perform to the scrutinizing standards of domestic health club equipment. HF972 Aerofit Spin bikes are built to perform to the scrutinizing standards of domestic health club equipment. 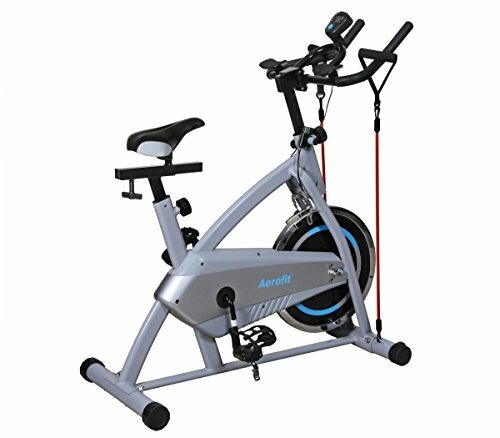 Compare the features of the Aerofit spin bikes and you will find how quality components, precision engineering, state-of-the-art mechanism and the best quality in the industry combine to make Aerofit the premier name in home cardio fitness. Heavy gauge welded steel construction. 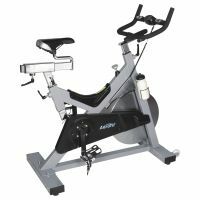 Aerofit spin bike boasts a beautiful metallic coat finish on a frame. Display Feedback Multi-feedback read out instantly displays time, distance, speed and calories. Pedals Self balanced wide paddles with adjustable straps fit to any size user. Close spacing, shock absorbing air cushion and provides gentle movements. Frame Structure Strengthened main frame makes it sturdy stable and elegant. Handle Bar Chrome with PVC dipping and 6 level vertical adjustment. Spin Wheel1 12 Kgs, high inertia spin wheel. Resistance System Dual side brake system which make the bike safe and stable, two piece fender for comprehensive protection of brake and spin wheel. Drive System Centre design drive, metal belt driven. Resistance Level1 Smart release breaking system provides safe dependable performance for unsupervised rider. Frame Design Frame is designed based on human engineering theory which makes more comfortable. Resistance Rope Two side resistance ropes help to workout arms and upper body. Seat Pop-pin seat slider horizontal and 11 steps vertical adjustments deliver a great fit. Crank Assembly Single pieces crank assembly with increased strength provides dependable performance for every rider. To Recieve updates and possible rewards for Aerofit AF 110 please sign in. To Recieve updates and possible rewards for Exercise Bike please sign in.